Google’s latest software update for ChromeOS devices, such as Chromebooks and Chromeboxes, improved the user experience with interface tweaks and a few new functions. Google(s goog) outlined all of the changes in a blog post announcing the update, but I’ve found a key one that isn’t mentioned: Support for watching television shows and movies from the Google Play store. Last month, my Chromebook lost a little lustre when I tried to watch a television series I had purchased from Google on my Chromebook. At the time, Google said Chromebooks weren’t supported, although most people wouldn’t likely know that prior to purchasing the content. It wasn’t until after I tried to view my purchased media that I saw an error message and found a support page showing the limitation. At the time, I thought it was ridiculous: Why is Google selling content that can’t be viewed on devices that run Google’s own ChromeOS, especially when the videos are served up by YouTube? The problem is gone now, however, although Google’s help page still says ChromeOS devices aren’t supported. 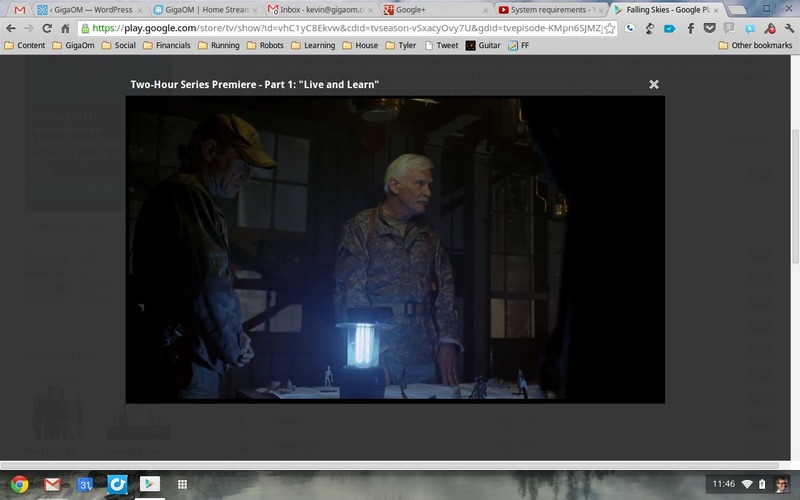 As I was using my Chromebook after receiving the latest software update, I tried watching a Falling Skies television episode since I missed both seasons on cable. And this time, I was successful! Before the software update, I was forced to watch the show on a smaller Android tablet; fine in a pinch, but I wanted the larger display on my Chromebook for viewing. Those that follow the Dev and Beta channels of the ChromeOS won’t be surprised by this fix as it was implemented in prior versions leading up to the current Stable update. But the target mainstream audience of ChromeOS customers aren’t likely in that loop, so it surprises me that Google didn’t announce this support in conjunction with the software update. Regardless, I’m just happy that it works. Of course, I had already plowed through both Falling Skies seasons on my Nexus 7, so now I need something else to watch! On a final note: I tested to see if I could start watching a video on my tablet and then pick up where I left off on the Chromebook. No such luck, so I hope Google is working on that as a future feature for the ChromeOS. Hi – Can you us a usb HDTV TV tuner with the New Chromebook? Highly doubtful because no software on the device would be able to access it or do anything with it. Remember, this is basically a web browser and the only thing you can install are web extensions for Chrome. Hi – do the latest versions of chromebook allow for viewing movies offline? How is this supposed to be done? How many movies can fit on the 16GB internal storage. My concern is for airline travel. You can watch locally stored video files on a Chromebook; I’d figure about 1.5 GB or so per movie but it will vary. So I you wanted to carry 4 movies for offline playback, that’s not a problem. Don’t forget there’s an SD card slot, so you could add plenty of extra storage if needed. i have a chromebox but am having issues watching sky on it even though iplayer works fine. does anyone else have these issues? When is 4G going to be used? my feeling is that Google sees the writing on the wall, namely that 4g and whatever comes out next year from the cell carriers is just not going to be able to deliver the bandwidth people need. wifi networks are popping up more and more in the cities and on the campuses where this machines will be used. Two big problems with ChromeOS. One no local storage of pics, songs documents. Big issue for parents. Two why/how can you we load it on an old machine like we do with Linux to give it new life?? Dave, not sure I follow. My Chromebook has 16 GB of integrated local storage for any files of my choice. I have 1080p movie trailers stored there, documents, pictures, MP3s and more. As far as why you can’t load it on an old machine, it’s likely the same reason OS X isn’t supported on just any PC hardware; Google, like Apple, is trying to offer an experience, not an operating system alone.